Dogs might not just be humans’ best friends — it turns out they’re cool with robots, too. More than 12 million people across the U.S. and Europe have already encountered one of Starship Technologies’ self-driving delivery robots. Just six months ago, the San Francisco-based startup announced an additional $25 million in funding, meaning it could soon deploy even more of its bots. To ensure that the robots don’t cause any hardships for people with visual impairments, Starship teamed up with UK charity Guide Dogs for the Blind on a pilot project to see what happens when guide dogs encounter Starship’s robots in public. For the project, a dog would set out with its owner or trainer on a typical daily activity. Along the way, it would meet one of Starship’s delivery robots. No matter how the bot approached the dogs — head on, from the rear, at a road crossing — the animals never reacted in a negative way. Most just stopped and waited for the bot to approach. 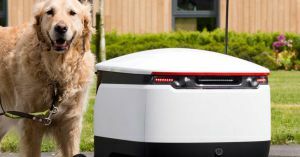 Guide Dogs plans to use the results of the pilot project to train newly recruited dogs to react in the same calm manner, treating the delivery robots as they would any other obstacle. “Technology is constantly changing our environment and the way we live, so it’s vital that Guide Dogs as an organisation leads the way in shaping that environment for people with a vision impairment,” John Welsman, Policy Lead, Travel, and Mobility at Guide Dogs, told The Evening Standard. All the dogs in the pilot might have reacted favorably to the autonomous bots, but the same can’t be said for humans. We’ve already witnessed examples of humans lashing out physically against self-driving cars and security robots, and that’s nothing compared to the number of verbal attacks waged against the machines. So far, that aggression has seemed to do little to slow the adoption of autonomous bots. All signs point to an increasing number of the machines everywhere in the future, from our workplaces to our streets. So it’s important that we consider how those robots could affect all members of society — including people with visual impairments and their furry helpers.